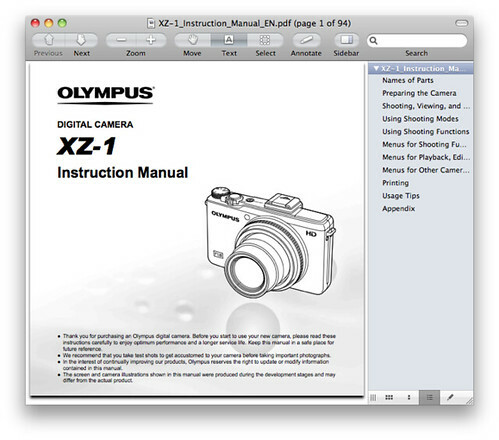 The English Language Olympus XZ-1 user manual / operating instructions (Olympus calls it the “XZ-1 Digital Camera Instruction Manual”) is now online and available for download at olympusamerica.com (right-click and save the user guide to your hard drive). If the download link didn’t work for you, go to the Product Support page for the XZ-1 and manually locate the file “XZ-1 Instruction Manual (English) (3.1 MB)”. The guide is also available in Spanish and French. Unlike with Nikon, Olympus allows you to freely print the XZ1 owner’s handbook without building in any password protection into the PDF. The file size of 94-page Olympus XZ-1 Adobe Acrobat PDF document is 3.2 MB (megabytes). The guide discusses the features of the XZ-1 and how to use the camera. 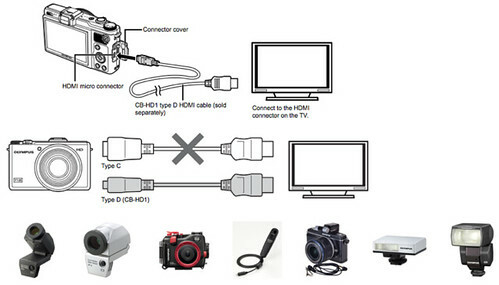 Page 61: Connecting a Type D Micro HDMI cable. Page 80: When to use the VF-2 (black / silver) electronic viewfinder. Page 80: Using a dedicated external flash unit. A table presents the functions available with various Olympus flash units such as FL-36R, FL-20 and the new FL-14. The manual notes that the built-in flash can be used to trigger and communicate wirelessly with FL-36R electronic flash guns via light pulses (this being known as wireless remote control flash photography, also called the Olympus wireless RC flash system). Page 81: The Olympus SEMA-1 external microphone adapter set lets you record higher-quality audio when shooting movies / footage / video clips. Page 81: The RM-UC-1 remote cable / shutter release control connects to the multi-connector port. Page 81: For underwater photography with the XZ-1, use the water-resistant housing / protector PT-050, which allows your “XZ-1 to be taken underwater up to a water pressure equivalent of 40 metres“.